At long last logic prevails. 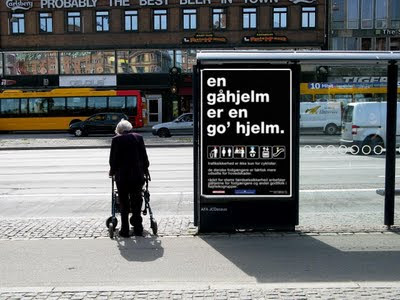 A new campaign has hit the streets of Denmark, thanks to the visionaries at The Danish Road Safety Council [Sikker Trafik] and Trygfonden [an insurance company]. Intense promotion of walking helmets for pedestrians has begun. This logic has been sorely missed. These two organisations have happily promoted bike helmets but pedestrians suffer just as many head injuries, if not more. "Traffic safety isn't just for cyclists. The pedestrians of Denmark actually have a higher risk of head injury. The Danish Road Safety Council recommends walking helmets for pedestrians and other good folk in high risk groups." The slogan is catchy in Danish since it kind of rhymes. All in all it's a brilliant project. Let's save some lives. "A bike helmet is a fine substitute for walking helmets, so there's no need to take it off when you get off your bike. Keep it on throughout the day for maximum safety." 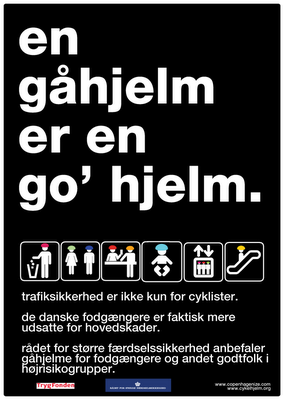 Indeed, they have a point when they add: "We have almost one million daily cyclists in Denmark but we have 5.3 million pedestrians. It's a group that daily navigates the danger zone and we wish to make them aware of their potentially lethal actions." All the projects we support are based on documented knowledge in the specific areas that the project is aimed at. This knowledge can be documented in, for example, analysis, scientific research and statistics. And with regards to pedestrian head injuries, the statistics and science are clear cut. Well done, Trygfonden. I sincerly hope that they keep this momentum and start the promotion of motorist helmets, too. Their logo could be proudly be emblazoned on this fine product. But for now, these pedestrian helmets are an excellent start. Logical, scientific and much needed. Just look at all these godless heathens who spite the safety gods in Copenhagen. Now we just need to defeat this crazy anti-car intiative.